After years of handling so many cases, Precious Ramotswe, the owner of the No. 1 Ladies’ Detective Agency, is finally going to take a vacation. She didn’t think she needed one and doesn’t even realize how she came about to accept such an idea but it seems that everyone agreed it was time she take one. Leaving the agency in the competent hands of Mma Makutsi, Mma Ramotswe decides she’ll try to relax at home and try not to get drawn into the agency’s business but after just a couple of days she thinks she’s done all she can do around the house and town and thankfully Mr. Polopetsi, their part-time non paid assistant investigator, has come to seek her help with a case. How will Mma Ramotswe handle this special case without upsetting her Mma Makutsi and her friend Mma Potokwane, who may be hurt by the findings of the case? If there is one thing she knows how to do is handle such special cases so with the best intentions and her calm presence Mma Ramotswe begins her investigation. If you’ve read the books in this series you know these mysteries are light and are mostly focused on the characters and the special place that Botswana seems to be. There are quirky characters and there always seems to be a gentleness about these books. 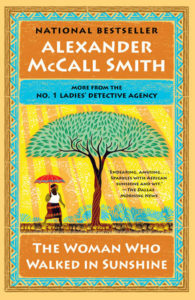 Mma Ramotswe does encounter sad situations, such as the case in this installment of Samuel the child who is watching parked cars, but there always seems to be some glimmer of hope at the end of the stories and when you close the last page you know all will be well. It’s been too long since I last read a No. 1 Ladies’ Detective Agency book!! I want to give this series another try. I started the first one many years ago and couldn’t get interested, but I’m hoping to try again. I’ve never read any of this series, although I enjoyed a few of the television series episodes. I really need to give this series another try–I like the idea of place and of a gentle type of mystery. It sounds a perfect January read–mystery, but not too dark and you get to be in a sunny place, too! Joann @ Lakeside Musing – It had been years since I read one of these too. I was really a fan but then I think they got a bit redundant which can happen with long running series but it was nice to come back to it. Great characters. Les in NE – I hope you’ll check them out. I find these to be nice cozy mysteries. The setting is really the big draw! Jenclair – I didn’t realize there was a television series until one of the book group members mentioned it. I may have to see if I can find that! Danielle – Oh and these are fast reads too and with all the talk about sun and heat these are perfect reads for the winter months! I was just talking the other day about being behind in this series. I think I am behind by about 5 books. And that’s not including the other series by this author.